Arundel Arboretum tree nursery in Sussex continues to be transformed into a spectacle of dazzling autumn colours. 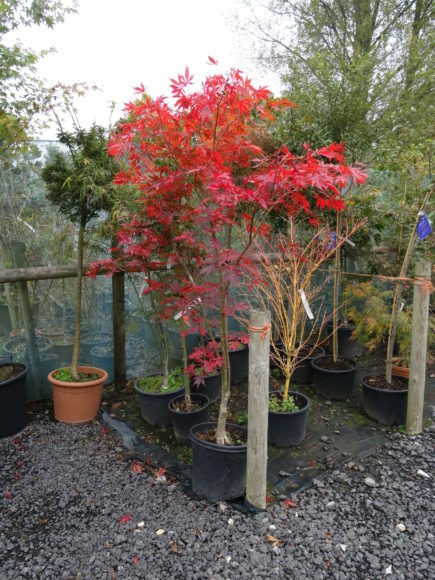 As we move further into autumn, our tree nursery takes on a new look daily as our many trees and shrubs continue to display their exciting autumn foliage. 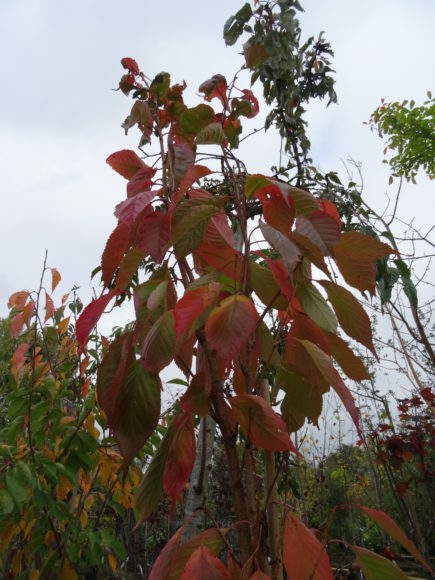 If you are looking to purchase a tree or shrub primarily for its autumnal appearance, now is the best time to do so, as you are able to see exactly how the tree looks at your preferred time of the year. This is also a good time to plant – your trees and shrubs will establish themselves over the winter months and will require less maintenance. 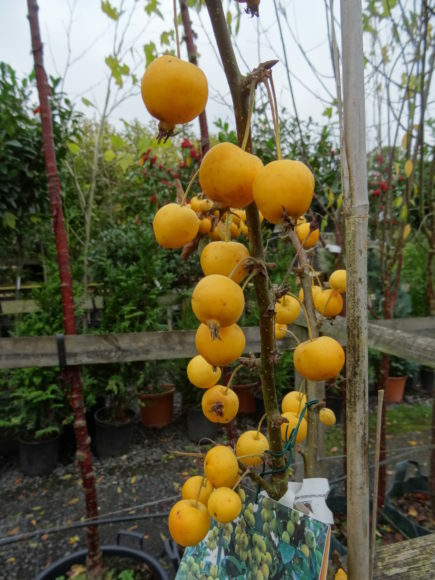 Malus ‘Golden Hornet’ is a small deciduous tree. It produces white flowers in the spring, which turn into deep yellow fruits in the autumn. These can survive well into the winter, provided the birds don’t get to them first! Malus ‘Golden Hornet’ will be happy in full sun or partial shade, in a sheltered or exposed position. It has an eventual height of 8m+ and a spread of 8m+. Prunus ‘amanogawa’ is a small, narrow column tree with upright branches. It is ideal for a small garden, with an eventual height of approximately 19′. In the spring, Prunus ‘amanogawa’ produces clusters of large fragrant single or semi-double shell pink flowers. The foliage is bronze-green in the spring, turning to mid-green during the summer months, turning orange\red in the autumn. Prunus ‘amanogawa’ is very tolerant of pollution, so it is an ideal tree for urban areas. 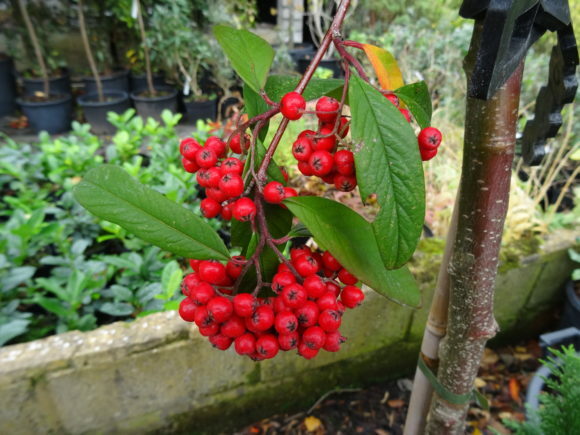 Cotoneaster ‘Watereri’ is a hardy small tree, which will grow happily in full sun. In springtime, it is massed with clusters of small, pretty white flowers. At this time of the year, the tree has brilliant red berries in abundance, which complement its large green leaves. Its arching habit makes for an interesting addition to your garden. Cotoneaster ‘Watereri’ has an eventual height and spread of about 5m. This small tree is ideal for wildlife. Acer palmatum ‘Scolopendrifolium’ is an attractive, deciduous Japanese maple with an upright growth habit. It will happily grow in full sun or partial shade, but like all Japanese maples should be positioned in a sheltered spot to protect them from adverse weather. Acer palmatum ‘Scolopendrifolium’ foliage emerges a deep green that turn to a vivid yellow-orange in the autumn. It has an eventual height of around 5m. Acer palmatum ‘Sumi Nagahsi’ is a small, deciduous Japanese Maple. Its foliage emerges bright red in the spring, which deepens to purple-red in the summer before finally turning crimson in the autumn. This Japanese maple should be planted in a moist, well-drained soil, using ericaceous compost. Acer palmatum ‘Sumi Nagashi’ has an eventual height of 4m and a spread of 3m. We shall look forward to your visit to our tree nursery, nestled in the South Downs National Park on the outskirts of Arundel. 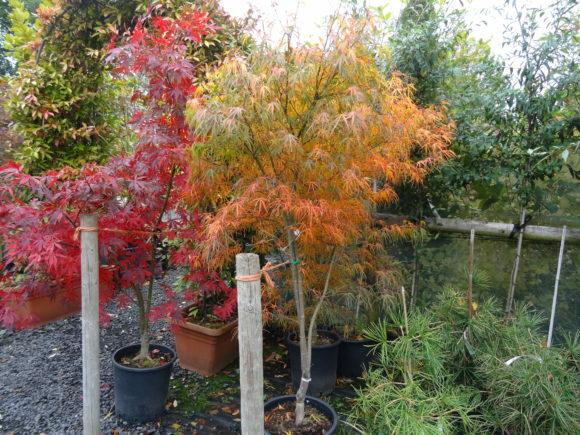 We are always on hand to give the best advice for the right trees and shrubs for your garden.